During the recent examination and certification of recovered money from the famous 1971 "D. B. Cooper" skyjacking case, PCGS Currency staff members discovered nearly three dozen serial numbers that apparently had not been previously recorded by the Federal Bureau of Investigation. 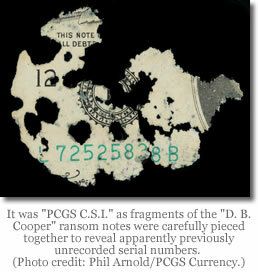 The numbers were hidden in layers of notes and note fragments stuck together for decades, and those numbers now have been reported by PCGS Currency President, Jason Bradford, to the Seattle-based FBI agent overseeing the case. In a letter to FBI Special Agent Larry Carr, Bradford wrote: "Earlier this month, members of our team examined two dozen environmentally-damaged $20 denomination Federal Reserve Notes and dozens of fragments submitted to us for certification by Brian Ingram of Mena, Arkansas. As you know, Mr. Ingram was the then-eight year old boy in 1980 who discovered some of the cash given in 1971 as ransom to a skyjacker known as ‘D. B. Cooper’ or ‘Dan Cooper.’"
After matching serial numbers with the FBI’s previously published list of ransom notes, we were able to carefully separate the submitted notes and fragments that had been affixed together for decades. In some cases, portions of as many as four notes were stuck together due to their apparent long exposure to water and various weather conditions. We also were able to piece together portions of several separate fragments, sort of like a bank note jig-saw puzzle, to make a complete serial number." "This process revealed 35 additional full serial numbers that are on the FBI’s 1971 complete list of notes given as ransom, but apparently were not recorded when the notes discovered by Mr. Ingram in 1980 subsequently were inventoried by investigators. We are pleased to provide the FBI with these ‘new’ numbers with the hope that any new evidence may provide useful leads in this case." 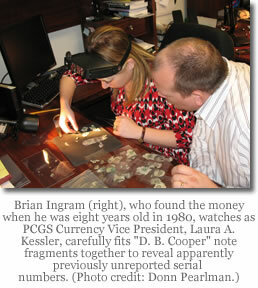 The letter was accompanied by a complete listing of all serial numbers on the notes submitted by Ingram, including the ones literally uncovered or pieced together by the PCGS Currency team. 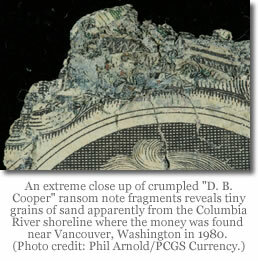 "One of the partially crumpled notes we closely examined still had grains of sand embedded in it from the Columbia River shoreline where Brian Ingram found the cash near Vancouver, Washington in 1980," said Laura A. Kessler, PCGS Currency Vice President. Collectors Universe, Inc. is a leading provider of value added services to the high-value collectibles and diamond and colored gemstones markets. The Company authenticates and grades collectible coins, sports cards, autographs, stamps, currency, diamonds and colored gemstones. The Company also compiles and publishes authoritative information about United States and world coins, collectible sports cards and sports memorabilia, collectible stamps, diamonds and colored gemstones. This information is accessible to collectors and dealers at the Company’s web site, http://www.collectors.com, and is also published in print.